Website redesign leads to a 1,300% increase in lead conversion rate. Homescout came to New Breed with an outdated website that was not designed with their ideal customers in mind and was not meeting their lead generation goals. Beyond this, they did not feel that the site was representative of their brand. 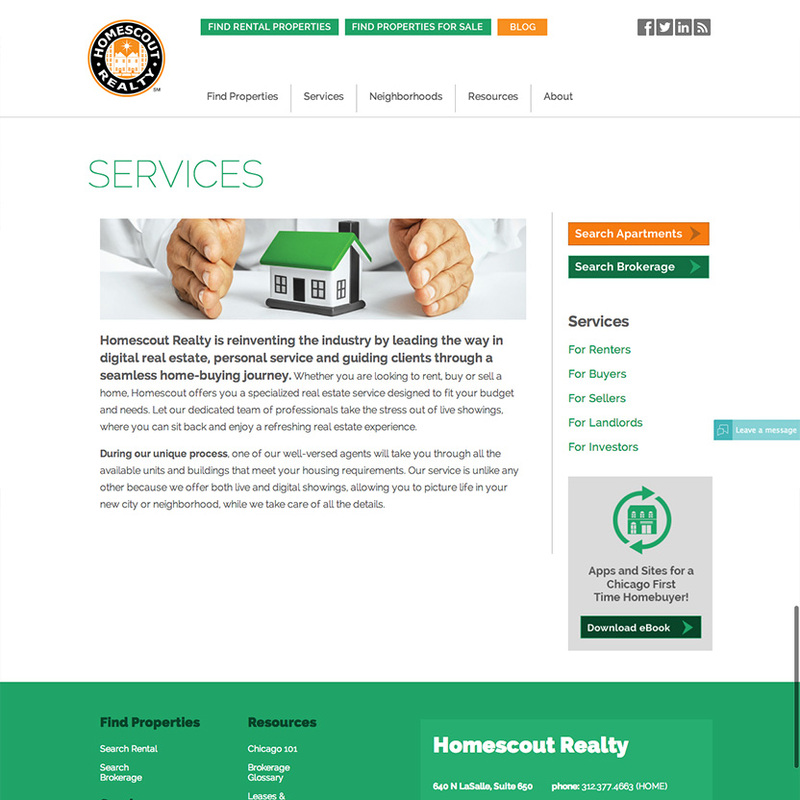 Homescout wanted their site to cater to clients long-term, maintaining and assisting their existing rental clients with their first-time home purchase, second time home investment and beyond. 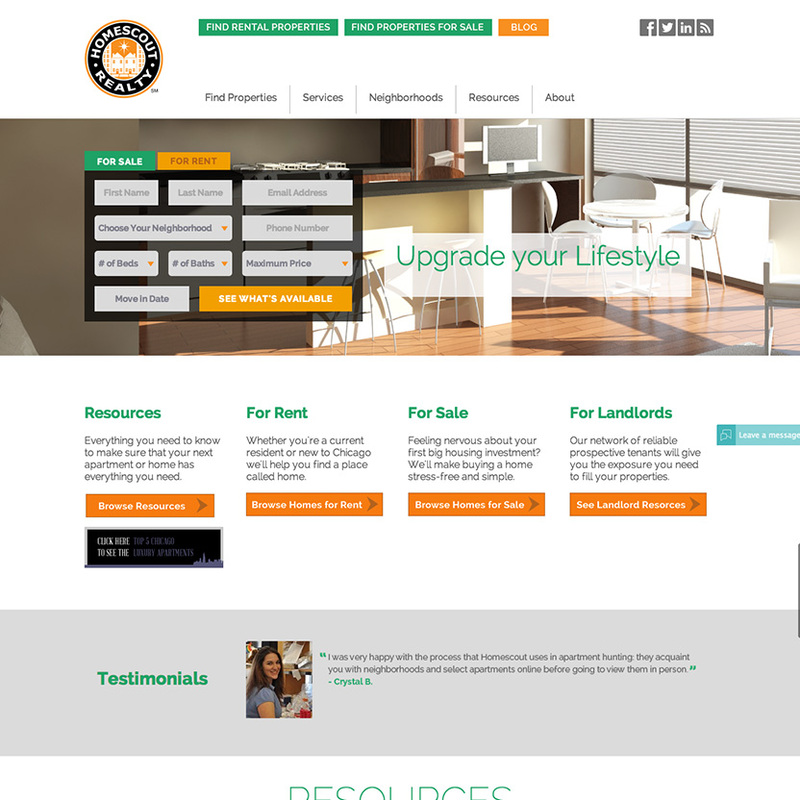 They needed a new website that would appeal to a large range of personas, which included renters, buyers, sellers, investors and landlords, highlighting the service offerings they provide to each. Through our Digital Onboarding Workshop we were able to identify their business goals and develop a persona-driven website architecture and wireframes and lay the foundation for their new site to be a success. Next up, we created a sales-ready website on HubSpot’s Content Optimization System. It is our belief that the homepage of a website should allow visitors to quickly self-identify their persona and navigate to the section of the site most relevant to them. In Homescout’s case we also developed a form, non-native to the HubSpot COS, to allow for bottom of funnel lead generation directly from the homepage. The Chicago real-estate market is very neighborhood-centric. To account for this, a special neighborhood layout was included to highlight information about Chicago’s different boroughs such as average rental prices, lifestyle and local transit. The new site also includes a resources section which clients can rely on for all their leasing, buying, and selling needs such as brokerage terms or helpful phone numbers (ie., utility companies, moving truck rentals, etc.). Since the launch of their new website, their visitor-to-lead conversion rate has skyrocketed to 5.6 percent, a 1300 percent increase! 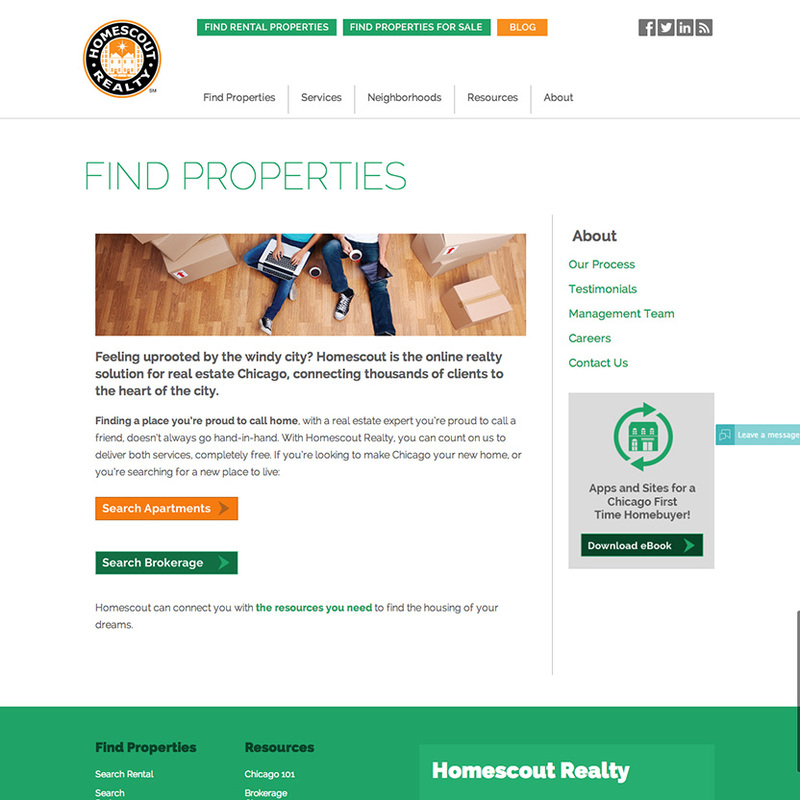 This new website is not only user-friendly, but it is informative and reflects Homescout’s fun brand while providing their broad range of clients with the necessary information and tools they need to rent, buy or sell with ease in the Chicago area. 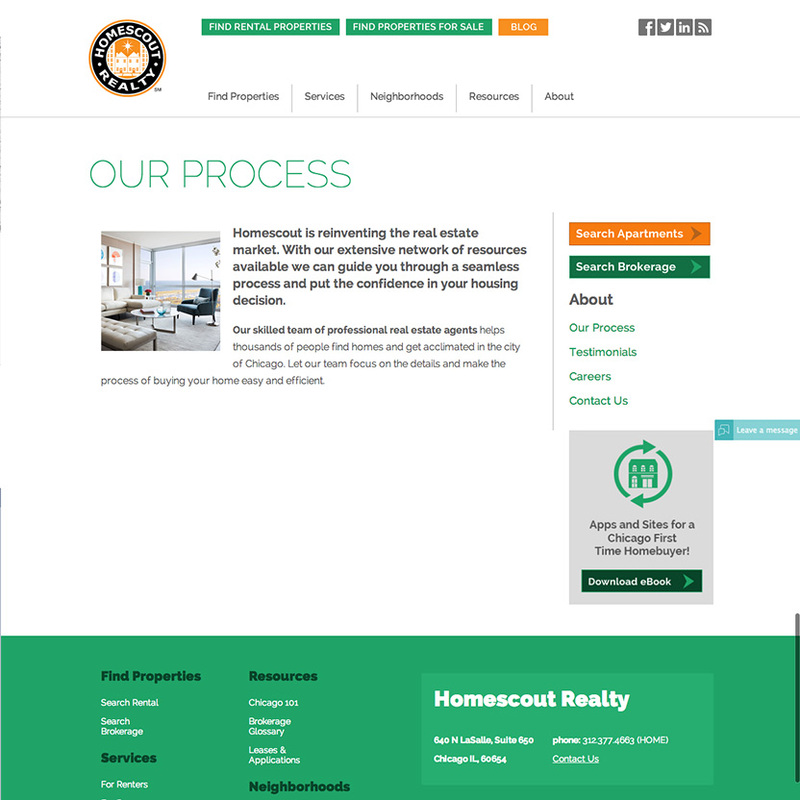 Homescout Realty is a Chicago based real estate company. Whether buying, leasing, or selling they help their customers find their dream home by taking into consideration aspects, such as neighborhood, desired apartment features and lifestyle. Homescout prides itself on giving their customers all the tools and information needed to ensure they are happy with their new home.